I am reproducing this from the book that i have for all sai devotees to taste the nectar of this adaptation online. Victory to Sai Ganesh ! Baba in the form of Lord Ganesh , the Omkar Rupa! Protect me from all evils.! * You inhabit dormantly in the mooladhar , the basic centre in the human body. * I prostrate before you , O Sai Ganesh . The tunes vibrating from the Veena of Goddess Sarawathi are the expression of yor musical genius. You are the immeasurable root cause beyond this universe. * O baba you are the moon of love and I am your Chakor. Will you not pour , O baba the stream of your ambrosial grace in my devotion ? You are the entity and the lone support. *You are my vital breath , the energy, the vast universe. You are capable of submersing the darkness of ignorance in blazing light of knowledge . I know for certain that in this drama you are the unseen stage director. The Sai Geethayan has begun with an eulogy of Ganesh and the invocation to Sai baba as the Master. The Primeval word Pranava has surged up from the limitless expanse of the cosmos. The formless has also assumed the shape of a human body. When the clouds of destruction loom low on the battlefield, when Parth becomes apprehensive and diffident , the clarion call of hope for new life beckons the lost purpose to steer the helm of duty. The God incarnated in new forms in every age for the establishment of Dharma, for destruction of the wicked and for the protection of righteous men. Lord Hari has incarnated in the Sai form on the banks of Godavari. On this very bank Shri Ram who fulfills the desires of his devotees , had stayed with Sita and passed his holy days and nights in her company. The sportive Divine actor has enacted the drama of Ramayan on the banks Gautami. The Godavari is the Southern Ganges having two banks named after sages Vasista and Gautam. The river relishes the sacred company of Bhagawat bhaktas. She pours the pitchers of devotion at the doors of the philosophy of unity of GOd and his loving bhaktas. Godavari embraces Kushwarta at one side ,while using the feet of Nathas as her pillow. She covers her body with blanket of Yoga and Bhakti. Goda is the stream of bliss. Nay , she is the lustrous line of light piercing through the darkness of Tamas. On this bank of Gomati, Lord Dattatreya ( poised on the enriched lap of Krishna River ) has assumed the fakir form of Malanga Sadhu. The Narasimha Saraswati Dattatreya with three heads has incarnated in human body here. The fakir of Shirdi is unique in as much as he has no trace of his name, nativity , relations , caste or creed. He is astoundingly startling in his internal as well as external nature . He is virtually the Ashwaatha with the roots sprouting upwards and the branches spreading below. He has no locks of hari. He binds a torn cloth round his head . He has no Kamandalu but holds a tinpot in his hands. A piece of bread is sufficient to quench his hunger . He is the endless immortal GURU thirsting for the devotion of his bhaktas. His Devotion has protective effect. His Love is sweeter than mother's affection . His grace is just a divine love showering on the bhaktas . He stands detached from world but is still attached to his devotees. Let us sing the glory of Baba for ages together without a pause . Let us praise his virtues incessantly . Let us offer our birth and rebirth at his feet . Let us become a flute on his sweet lips. Baba is the compassionate Guru treading the entire universe under his feet . Baba is Dattatreya, assuming a human form for performing his divine leelas through the village of Shirdi . My tongue may sing his glory in sweet songs for the sake of ecstacy . Sai baba manifested in Pathari in 1835. His guru Vyankusha a chieftain and saint of shahs in Nizam state looked after him from 1839 to 1851 . He first appeared in Shirdi beneath the Neem tree in 1854 as a boy of sixteen . 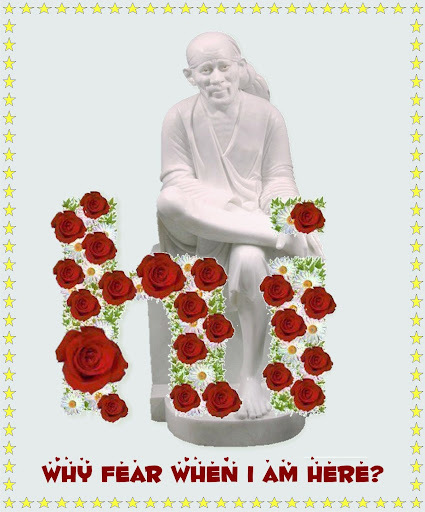 He reappeared in Shirdi in 1859 and lived there till his samadhi. He called Shirdi mosque , Dwaravati - Dwarka because its doors were open to all castes , creeds and religions ,he was Lord Shri Hari himself. Shirdi was the place where gods and demons churned the ocean of milk to secure Amrita, the rear fluid of immortality. Behold! This Divine abode of Baba. Here in Shirdi , where my lord Sai sat on a stone in his SahajaSamadhi. This is not Shirdi , but this is Dwarka of Shyamasunder Krishna , Dwaravati, The Golden Capital of Shri Hari . In fact this is spiritual Pandhari situated on the bank of Godavari . In this Pandhari , Bhagwan was waiting for his devotess for ages together. This Dwarka was submerged in the milky oceans and totally lost in oblivion. GOds and demon s churned the waters in order to find out the nine Precious Ratnas lying in its unfathomable depths. Shirdi can be called the sister of Sindhu and the mother of Goddess Shri Kamala . It has showered the nectar of grace in the sands of the humdrum of life. Th footprints os Sadguru Sai has been imprinted in the sacred dust of shirdi . The Guru is none else but Sai who has lighted the path leading to the hoouse of enlightenment and liberation . This Shirdi is the farmyard in the border of mortal world and the divine Kashi or Rameshwar. It is "Vaikunta" on the earth. The sky of shirdi is blue with compassion. The Wind has the fragrance of love . The waters of Shirdi have the longing thirst of merging in the ocean of Muklti . Shirdi is resplendent with the glory of my lord Shri Sai and his leelas and his mahima pervade the entire universe. Shirdi is the final destination of the journey towards peace . When you approach the Khandoba temple you still feel the form of a young fakir sitting at the doorsteps, for the lord had first manifested himself on this village border to meet his bhaktas and fulfill their longings. The nimba tree has still the sweetness absorbed by it , while my lord practised his penance underneath. The name of GURU burns here with celestial fragrance . Here you notice the golden crest of the Samadhi Mandir with flags fluttering majestically atop. The Shrine of my Lord which still resound breaking off the bonds of life and death. The Dwarkamai Masjid has showered joy and bliss on devotees which emanted from the loving touch of my lord. The divine love of Sai flowed as Godavari from this auspicious seat of GOD . This divine and lustrous pilgrimage leads from the border of Samsar to the horizon where known meets unknown . This is the last resort for lying down in eternal peace and tranquility . Sai Baba appeared on the bank of Godavari and with his magic touch obliterated the barriers of cast , creed and religion . He touched the life of devotees in a direct way through the portals of Faith and Patience. Nobody fully knows whence from he came . It is said that he was born in Pathari to a brahmin parents and was nutured by fakir couple . He developed in himself the refinements of Natha and Kabir cult blended with secularism . Vyankusha his guru enkindled the light of realisation . One day he appeared on the vilage border of Shirdi with a marriage party. He was greeted by Mahalsapati on steps of Khandoba temple as " Ao sai " . This occured in 1858. The fortune accumulated by us in hundreds of birth has borne auspicious fruit. Baba has come to Shirdi. The golden treasure has come to our door !. Baba has planted his divine feet in Shirdi. The God has assumed form of a young lad by using his Yoga maya. All the eight siddhis have been accompanying him from the very birth. The divine feet of God have manifested in the earthly soil of Pathari village . The land is blessed a thousand fold, where in the GOd has incarnated at his free will . The soil of Maharashtra is really blessed because Baba has assumed human form in this land . The parents denounced the life and became mendicants in search of truth . But the divine truth that was born was unknown to them. A fakir couple reared up Baba with the love and affection of real parents. All castes and creeds in India came to a level of equality. The faith merged with patience to shower the eternal peace . All discriminations and division melted in the fire of knowledge before Baba's presence. The new breeze of secularism came from the bank of Yamnuna , Ram and Rahim were eager to have a perfect union . Kabir began weaving his shelas of truth , love and equality. The young master hit the ground with the forceps. And lo there appeared fire to enkindle the chillum. Chand Patil was amazed at the miraculous event. O Priest of Khandoba you have invited me as 'Come sai' but you are resisting my entry into the shrine supposing that i am a Muslim ! ..
O ignorant pujari , DO you think that these touch of a Muslim Fakir would tarnish the /god who purifies the entire universe with this very touch ? The master of the universe is neither a hindu nor muslim he is not fetted by the chains of religion . He is above all religions creeds or sects ! He permeates all universe and still remains above it . He can never relish the confinement in four walls of a house. He has no religion ,caste or creed , O Priest do you think that the Chaitanya bears a stamp of a caste ? Sheer ignorance ! The Chaithanya is made up of no other case than that of Chaitanya alone ! Whatever scripture you choose to read, Geetha, Quran or Gur Bani, you will find Sai. But, how honestly one thinks and remembers on this fact? Good thoughts lead to good intentions; good intentions lead to good actions. Recent events and the religious riots in India must be considered as a blot to the system that has strong foundations in peace, tolerance and religious harmony. Loving our Sadguru is not complete until loving the next person regardless of his religion on orientation does not happen. Our devotion to our beloved Sadguru is not accepted until we learn to love the next Parsee or Hindu, the Muslim after and the Christian after. Let all the Sai devotees spend a moment this peaceful Thursday remembering the descriptions of Saidarbar of the old Shirdi days, where children of every religion flocked around their only father. Let our thoughts be filled with those intentions, the intentions to serve and love. It is the simplest way to seek Sadguru's attention! O Young Divine las, my heart is pining for your sight . My motherly love overflows through my eyes and bosom my dear Son !! would accept a single morsel of bread from your ignorant mother..
mother. Allow me to feed you , with this loaf of bread together with mytears of affection and springs of sentiments. overflow and my bosom aches with the pangs of compassion. lght has arised up from the base of this margosa tree. dampenend with delicate mellifluous sentiments for the mankind. in your frame the power of creation , sustenance and destruction ..
the barriers and spread all over the world. sacred village of Babas abode. auspicious by Baba's touch . The sacredness fills the houses , the temples and the landscape of Shirdi . giving the boon of purity to every living being in the village boundaries. The brightness of penance shines om his Divine Face. He is an unfathomable ocean of merits. He is spiritualism incarnate. He is the flame of Atman dispelling the darkness of ages. The sacred soul of Shirdi will emablazen the Facades of eight quarters. The entire universe will bow down at his feet . The whole life will be bathed in waters of Ganga with touch of this young Saint. Gangagir maharaj knew the spiritual glory of the young Saint of Shirdi. But common mans till was unaware of the lads divinity. Baba was fond of illuminating the Masjid with oil lamps. Once the grocers in Shirdi denied giving him oil for lamps" . Baba lit the earthen lamps with water and the lamps shed light throughout the night. This miracle spread out Baba's Mahima beyond the borders of Shirdi and established him as a man of amazing power and divine lustre. The wicks burn without oil , whenever the lustre of Atman is ablaze! The flames are lit with water. This is the miraculous way of the Lord . Sai loved to light earthen lamps in the Masjid and enjoy the festival of lights every night. The Dwarkamai was flooded with light emanating from the wicks made of oiled rags. The unwise merchants in Shirdi thought that this was luxury of a beggar and they could no longer tolerate this . They cannot afford to support the madness . The perverted minds of the grocers denied giving oil to Baba. Baba was an unattached master of the universe . Would he be short of oil when the Goddess Lakshmi was his maid servant . His face was unperturbed . His peace of mind remained unruffled. The lustre was passed on from the divine Atman of Baba in the form of a flame. The water principle was transformed to Tejas principle and teh wicks burns without oil. when the lustre of soul is illuminated the lampsburn without oil . This is the miraculous way of the Lord . Enjoyed reading Sai Geethayan . Sai bless you and guie you in everyway Shammi. (Baba explained to Shama HIs divine protection to one who sings his glory . Shama was a Satyabhaktha , an example of dedication . Another Dhyani Bhakta was Nanasaheb Dengle. Baba admonished the philosophy of knowledge and duty. Dhyanayoga and Karmayoga to Nana. Baba dwells upon the eternity of soul, transience of life. The life is fleeting and mortal by its very nature ! Yet the soul is immortal without begining or end. Whence have these kiths and kins appeared ..? Where from have the family and fortune come ..? It is the desire that creates this momentary phenomenon. The fantasy whirls rounds the body till it exists. The life thed death and the ignorance have their source within the thirst, the lust and the desire. The attachment and lust assume multiple forms. The ignorance itself takes changing shapes . The man in his lack of understanding believes that he is the doer of Karma. The ego of the 'doer' creates new karma and blinds the human being to new fate. Remain in close liason with the divine feet of the Lord. Surrender all desires,lust and pride at the Lord's feet, Do your duty without expectation of friut or honour . Let the ego of the doer be burnt in the fire of knowledge. Behold the form of God in everything . Treat Gold and dust alike. Do not desire for fruit of actions, Cast off attachment. Be conscious of the Lord in every being . (Baba unravelled to Nanasaheb the pith and core of Dhyanahakthi in which he embracedd transience of life , the lure of Maya and the futility of ego sense . The Ravages of samsara are unveiled by decay and death. The incessantly burning Dhuni ( fire) in the masjid made the Udi to the vistors as prasad. This was a symbolic offering to awaken the ignorant men and women steeped in desire to the final remains of physical life. It simulatneoulsy rejuvenated the dedicated devotees cured them and enjoined them to the divine life, the immortality of soul and the magic touch of grace.
" The Human existence is finally reduced to a handful of ashed, the wealth the kith and kin are momentary asociations. This is what the Dhuni fire tells us day and night. Awake , arise besmear the udhi on your forhead . Though this is a product of the same fire of Dhuni , it would unfold to you the dazzling light of immortality beyond death . Besmear the holy ashes. These are no ashes , this is life that survives demise . This is the bond of Lord Krishna's everlasting love. This is the holy thread of proctection vouched by the Master of Dwarka. This is a living potrait of the divine principle in the wolrd of mortal beings . The life is a perpetual and unending warfare against lust and desire . This collection of five senses will vanish into five elements.These ashes are throbbing with the music of the Lord, only have ears to listen to it. The auspicious smearing of the ashes dispels ,the fever of the world( bhava) . The ashes shower Atmic bliss , eliminate the veil Maya and floos life with the nectar of grace. ( The Master was weaving a bond of love for his devotees in order to link them with god . Who was but a manifestation of Love light , knowledge and bliss. However people recognise siddhis and miracles better than any upadesha. Baba was united with the cosmic God and this manifested itself from his every word , deed or even look ! O Siddhis sing your lullaby in a low tune for the Master is resting in his yogic trance on a narrow plank with the lamps burning on the four sides .. The Master is asleep on the swings of rags. Sing your lullaby !!. Nobody knows when Shri Hari Sai has reposed on such a height. He was on the ground a little while ago. How can the material world know the mystery of the divine world..? Sing your lullaby !! The dark night is full of dead silence , yet it is illumined by the four lamps in four corners , The name of Rama resounds in Sai's heart . The entire universe lies open before the omniscient eyes of the Master , which outwardly seem closed. Sing your lullaby !! Page created in 0.392 seconds with 69 queries.